In an age of de-materialisation and digital communications, one might think the business card is surplus to requirements. This is careless – the card still serves the same purpose it always did – as a simple memory aid, or as a genuinely handy reminder of your contact details. Remember that you’re not just dishing out your phone number and email address any more; a modern card can also include LinkedIn, Twitter and Facebook addresses along with the company website. It’s all advertising, and an ingenious business card can have real impact; take a look at these cards, adorned with human sweat. You can produce cheap business cards which are purely functional and this is often enough, but if you’re working in the creative industries there seems to be active competition as to who can invent the best business card – presuming it’s a reflection on your creative powers. Cards with multiple dimensions and pop-ups are becoming popular and some will even put ‘a face to a name’ by printing your image on the body of the card. Business cards needn’t even be a formal ‘card’, they can come in the form of a balloon, Lego figures, USB sticks or any neat object that you can probably think of. Packets of seeds, cheese graters, combs and variety of objects have all been made into business cards. If you can think of something handy which the recipient might keep, you’re business card will serve as a constant and useful reminder. Think about the nature of your business and how you could draw attention to your product via something synonymous with the trade. A bathroom fitter could issue bath plugs with his own company moniker and contact details, a hair salon could hand out combs with contact details, or a bakery could have edible business cards. The important thing is, it’s all advertising and anyone in the business world needs an effective business card – even if it isn’t as outlandish as the ones mentioned here. For many businesses an air of professionalism and gravity is the most important factor. If you’re after a new business card that exudes an air of authority, consider companies like Instant Print for their experience in the trade. Who knows where the future of business cards will end up: some have proposed augmented reality where your card comes alive with the right digital paraphernalia. Maybe cards will interface directly with your phone, calling the service on contact with the card or perhaps the business card will simply remain a good old memory cue. No matter how much times change, a few basic business artifacts will remain essential. What do you think? 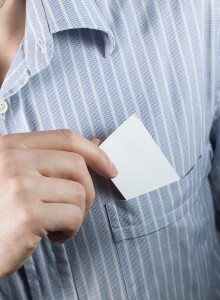 What does the future hold for traditional business cards? Seen any crazy cards lately that really stuck out? Cameron Matthews is a freelance writer from Leeds. Graduating in linguistics and management studies, he writes pieces surrounding facilitating communication and management techniques.